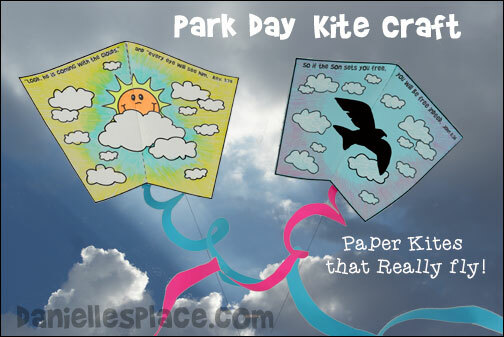 Use these paper kites to make your next park day extra special. 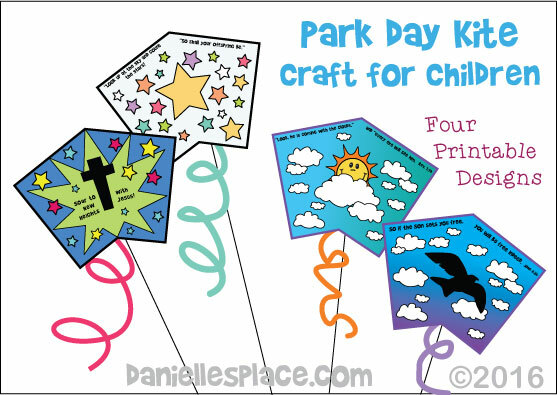 These simple kites are great for a family fun day or homeschool group activity. They only take a piece of paper, some string, tape, and a straw and are very cheap and easy to make. And the best thing of all, they actually fly! Paper Kites - Creative, Educational and Fun - All in One! 1. Print out the patterns onto legal-size paper (8.5" x 14"). Select the legal-size paper setting and "fit print to page" when printing. 2. Cut out around the edge of the printed patterns and fold them in half on the dotted line. 3. Have your children color the patterns with highlighter markers, crayons, colored pencils, or markers. 4. Fold the two flaps out on the dotted lines so that the picture is visible and comes together in the middle. Tape the kite down the center with scotch tape. 5. Put pieces of tape over the two smaller circles on the under side of the kite and use a hole punch to punch a hole through the paper. Tie one end of the kite string through the hole. Wind the other end of the string around craft sticks. 6. Punch a hole in the larger circles near the fold, stick a plastic straw through the hole and center it on the kite. Tape the straw to the underside of the kite. This will keep the kite from bending. Instead of punching more holes, you could just tape the straw to the top of the kite. 7. Cut an 8-inch circle from another sheet of paper. Cut the circle into a snake shape (start cutting around the outside of the circle about 3/4" from the outside and go around and around until you reach the center). Tape one end of the snake to the bottom of the kite for a tail. Watch a video of how to make the kites and watch them fly. 2. "Soar to new heights with Jesus"
3. "Look up at the sky and count the stars!" "So shall your offspring be." 6. Two kite-themed activity sheets. 7. Kite-shaped printable sight word cards. Two kite-themed activity sheets - See below. Kite-shaped Sight Word Cards Printable - See above. 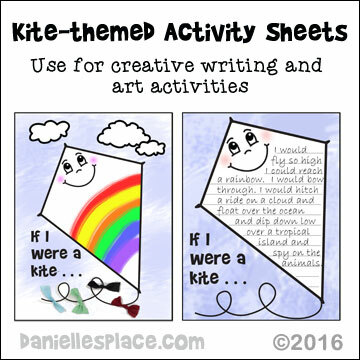 Use these kite-themed activity sheets for creative writing and art activities. Read books about kites and flying kites. Ask your children to imagine that they were kites and write about what they would do if they were a kite. There a two different sheets available, one with lines that you can use for writing poems or for younger children, and one with just the title. 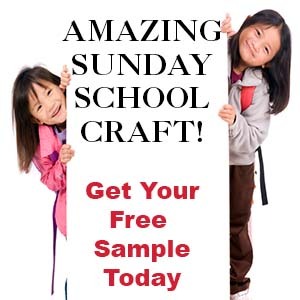 You can have your children design a kite and then glue pieces of material that have been tied in knots to the kite tail. The printable patterns are available to members and as digital downloads with the Kite Patterns Above. Making kites is not only fun, but educational. Here are some things you can do with these paper kites with your homeschool group. 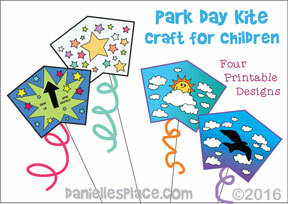 Print out the free blank kite pattern and the Directions above to make paper kites. Have your children decorate their kites using a specific theme. Give prizes to the most creative design, the highest flying kite, the kite that stays in the air the longest, etc. Have your children experiment with different kite designs, longer and shorter kite tails, or tails made from different material, and where the line is connected to the kite. Ask them which designs worked the best and why they think they worked better. Talk about gravity, lift, weight, drag, and thrust and how it affects the flight of the kite. Print out a kite pattern from Will Hillenbrand's web site and make a kite like Bear and Mole. This kite is more complicated than the kite craft on this web site, and you will have to buy some sticks from your local craft store to make the kite. The author uses large match sticks. He also uses a box cutter to cut out the kite which isn't recommended for children. 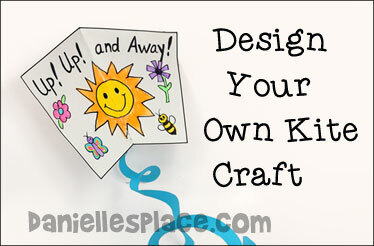 Instead you could use the blank kite pattern available here and have your children decorate their own kites. You can even write "Kite Day" on the kite patterns before having your children decorate them. Read "Be the Kite" and have your children draw pictures of where they might fly and what they would see if they were kites. Visit Cathi Bosco's website to see pictures other children drew after reading this book. The Kite (My First Reader (Paperback) - You can probably find this book at your local library. Young children will love reading this book all by themselves or with help from a parent. You will find a list of twenty words at the beginning of the book which are used in the story. Use the words to make kite-shaped sight word cards to review the words with your child before reading the book. 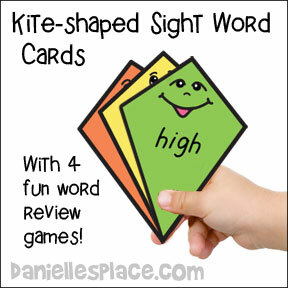 Use these sight word cards with your child to learn new words when reading books about kites. Print out the kite-shaped word card onto card stock. Read the book you will be using before you read it to your child. Write words on the kite-shaped cards that you think your child doesn't know. Review the words on the cards before you start reading the book with your child. Show him one word at a time and ask him to read the word. If your child can read the word remove it from the pile of cards. Ask your child to pick out a few word cards that he didn't know and have him hold them in his hand as you read the book. Tell your child to hand you the word card that matches the word you read as you read the story. When you have finished the book play word games to help your children remember the words. 1. Find the word - Place all the words face down on a table. Tell your child to pick one word from the story and then take turns turning over a word card to see if it is the word. If it isn't the matching word, turn the card back over. Keep playing until someone finds the word. 2. Match Game - Make two copies of the word cards and play a match game. 3. "Make a Sentence" Game - Add more verb cards to your set of cards and then turn them all over on a table. On the word go each player should turn over one card and place it one the table in front of him. Keep playing until one person has a complete sentence. Turn all the cards over again and play again. Curious George was one of my favorite characters as a child. He was always getting into trouble, and the man with the yellow hat would always show up to rescue him. Share this book with your children on your next kite day or fun day.